Provenance is information about entities, activities, and people involved in producing a piece of data or thing, which can be used to form assessments about its quality, reliability or trustworthiness. PROV-DM is the conceptual data model that forms a basis for the W3C provenance (PROV) family of specifications. It defines a concepts for expressing provenance information enabling interchange. This document introduces an XML schema for the PROV data model (PROV-DM), allowing instances of the PROV data model to be serialized in XML. This document is part of the PROV family of documents, a set of documents defining various aspects that are necessary to achieve the vision of inter-operable interchange of provenance information in heterogeneous environments such as the Web. These documents are listed below. Please consult the [[PROV-OVERVIEW]] for a guide to reading these documents. PROV-LINKS (Note) introduces a mechanism to link across bundles [[PROV-LINKS]]. The Provenance Working Group encourages implementation of the material defined in this document. Although work on this document by the Provenance Working Group is complete, errors may be recorded in the errata or and these may be addressed in future revisions. For the purpose of this specification, provenance is defined as a record that describes the people, institutions, entities, and activities involved in producing, influencing, or delivering a piece of data or a thing. In particular, the provenance of information is crucial in deciding whether information is to be trusted, how it should be integrated with other diverse information sources, and how to give credit to its originators when reusing it. In an open and inclusive environment such as the Web, where users find information that is often contradictory or questionable, provenance can help those users to make trust judgements. The PROV data model, PROV-DM, presents a generic data model for provenance that allows domain and application specific representations of provenance to be translated into such a data model and interchanged between systems. Thus, heterogeneous systems can export their native provenance into such a core data model, and applications that need to make sense of provenance can then import it, process it, and reason over it. The PROV data model distinguishes core structures from extended structures: core structures form the essence of provenance information, and are commonly found in various domain-specific vocabularies that deal with provenance or similar kinds of information [[Mappings]]. Extended structures enhance and refine core structures with more expressive capabilities to cater for more advanced uses of provenance. The PROV data model, comprising both core and extended structures, is a domain-agnostic model, but with clear extensibility points allowing further domain-specific and application-specific extensions to be defined. This specification's goal is to provide a succinct definition of the XML form of PROV-DM, thus, we refer the reader to the PROV-DM to provide overall justification and context to the definitions presented here. The PROV namespace is http://www.w3.org/ns/prov#. All the concepts, reserved names and attributes introduced in this specification belong to the PROV namespace. The prefix prov is used when referring to the PROV namespace. The key words "MUST", "MUST NOT", "REQUIRED", "SHALL", "SHALL NOT", "SHOULD", "SHOULD NOT", "RECOMMENDED", "MAY", and "OPTIONAL" in this document are to be interpreted as described in [[RFC2119]]. Several general design principles and patterns were used in the construction of the PROV XML Schema. The PROV-XML schema have been modularized so that xml-elements denoting terms defined in Working Group Notes are defined in separate extension schemas. All xml-elements denoting terms defined in the PROV-DM are defined in the http://www.w3.org/ns/prov-core.xsd schema and xml-elements denoting terms defined in PROV Working Group Notes are defined in extension schemas (e.g. http://www.w3.org/ns/prov-dictionary.xsd, http://www.w3.org/ns/prov-links.xsd). The default schema, http://www.w3.org/ns/prov.xsd, imports http://www.w3.org/ns/prov-core.xsd and all extension schemas. With this modeling all PROV xml-elements, even those denoting terms defined in Notes, are declared from the default schema. If the user wishes to leverage a schema that does not include xml-elements corresponding to terms from the PROV Notes the user can use schemaLocation to directly reference the core schema. Extension schemas import the http://www.w3.org/ns/prov-core.xsd schema and make use of a substitution group on the prov:internalElement to add extension-defined xml-elements to the list of valid PROV xml-elements in a bundle or document. This schema design leveraging substitutionGroups on an abstract xml-element may result in sub-optimal binding classes being generated by Object-to-XML frameworks such as JAXB, JiBX, etc. See the PROV FAQ entry at How should I generate JAXB classes from the PROV-XML schemas? for a JAXB-specific discussion on using OXM technologies with the PROV schemas. All schemas developed by the PROV WG utilize the PROV namespace. The general design pattern for the XML schema has been called Salami Slice Design. With this design, the individual components are each defined at the top level as separate xml-elements with distinct xml-types. This allows the xml-types to be easily reusable for domain specific extensions. The prov:document xml-element has been defined to act as a convenient root xml-element for a PROV-XML document, but it's use as the root xml-element is not required. The schema follows the Salami Slice pattern to ensure PROV XML xml-elements can be integrated with mixed-schema XML documents which require a different document root. The PROV Notation (PROV-N) is a serialization of the PROV Data Model described in [[PROV-N]]. Examples in the [[PROV-DM]] document are encoded using PROV-N. Because of the heavy use of PROV-N syntax in [[PROV-DM]], the PROV-XML editors feel it is important to present a comparison of the PROV-N and PROV-XML syntaxes and justifications behind the select syntax decisions in PROV-XML. In PROV-XML the PROV identifier is treated as an xml-attribute (prov:id), the prov-"elements" are treated as xml-elements, always with the same required order (position) as the PROV-DM/PROV-N description followed by optional prov-"attributes" which are also represented by xml-elements. As in PROV-N, the prov-"attributes" can be specified multiple times, but unlike PROV-N the prov-"attributes" have a fixed (alphabetical) order. The prov-"attribute" xml-elements are always defined at the end of the encompassing sequence after all prov-"element" xml-elements. XML Elements defined in namespaces other than the PROV namespace may be included after the prov-"attribute" xml-elements. Wherever an "id" is referenced from a later concept, the id is referenced as a prov:ref attribute of the element within the concept. Most of the concepts described below follow this general pattern. The PROV-DM states type information is described using the prov:type prov-"attribute" and may occur multiple times for a given entity, activity, agent, or relation. PROV-XML uses the xml-element prov:type to represent the prov:type prov-"attribute". This xml-element can be use to represent both PROV and non-PROV type information. The following examples shows type information encoded using the prov:type xml-element. The prov:type xml-element can be used in conjunction with schema-defined PROV types (see examples 2-5). PROV-XML defines complexTypes to match the PROV defined type values (prov-type). These xml-types provide a more native XML representation of prov-"types". The following example is considered equivalent to the previous example because the xml-element prov:plan has xs:type=prov:Plan. All complexTypes representing a prov-"type" which is defined as a subclass of another prov-"type" are defined in PROV-XML as extensions of their parent prov-"type's" complexType. For example, prov:Plan is defined as an extension of the complexType prov:Entity and may be referenced by either prov:plan or prov:entity xml-elements. When an extension xml-type is used a prov-"type" may be inferred. Explicit type declarations made using the prov:type xml-element may be easier for some encoding transformation tools (such as XSLT) to process, therefore use of the prov:type xml-element is highly encouraged even in cases where prov-"type" information is determinable from schema defined ComplexTypes. Because the prov:Plan complexType is defined as an extension of the complexType prov:Entity, the following example using xsi:type is valid and considered equivalent to the two previous examples. The xml-attribute xsi:type tells an XML parser the complexType of the xml-element. The value of xsi:type must be a complexType derived from the default xml-element xml-type in a schema with known location (referenced through xsi:schemaLocation). A prov-"type" xml-element may be inferred by the use of the xsi:type xml-attribute. [[PROV-DM]] also mandates that all qualified names be mappable to a URI by concatenating the namespace URI with a local name. PROV-XML uses the prov:id xml-attribute to denote a PROV Identifier and the prov:ref xml-attribute to denote a reference-by-id to an instance of a prov-"type" or prov-"relation" which has a matching PROV Identifier. The value of prov:ref must be a valid PROV Identifier, but there is no requirement that for every prov:ref a corresponding prov:id must be known to exist. PROV-XML defines the type of both the prov:id and prov:ref xml-attributes to be xsd:QName as that is the XSD datatype that most closely matches the qualified name definition by [[PROV-DM]]. Care should be taken when generating PROV identifier values in PROV-XML such that there is a known mapping to a URI. The xsd:QName datatype is more restrictive than the QualifiedName defined in [[PROV-N]] (e.g. PROV-N allows local names to start with numbers), therefore valid identifier values in [[PROV-N]] serializations have to potential to not be valid identifier values in PROV-XML. It is recommended to enhance interoperability that provenance users strive to always use identifier schemes that map to valid xsd:QNames and URIs. XML element names are aligned with [[PROV-N]] record names (e.g. prov:wasGeneratedBy, prov:actedOnBehalfOf) and record parameter roles (e.g. prov:delegate, prov:responsible on a Delegation). XML Elements are named in camelCase which also conforms with [[PROV-N]] naming conventions. ComplexType names are aligned with [[PROV-DM]] prov-"type" names (e.g. prov:Generation, prov:Delegation). ComplexTypes are named in PascalCase which conforms to [[PROV-DM]] naming conventions and differentiates complexTypes from xml-elements in the schema. Provenance concepts, expressed as prov-"types" and prov-"relations", are organized according to six components that are defined in this section. Table 1 is a mapping of PROV-DM prov-"types" and prov-"relations" in PROV-XML schema XML complexTypes and xml-elements. In the rest of the section, each type is defined, in English initially, followed by its XML schema definition and some example. The first component of PROV-DM is concerned with entities and activities, and their inter-relations: Usage, Generation, Start, End, and Communication. The second component of PROV-DM is concerned with: derivations of entities from other entities and derivation subtypesRevision, Quotation, and Primary Source. The third component of PROV-DM is concerned with agents and the relations Attribution, Association, and Delegation, relating agents to entities, activities, and agents, respectively. 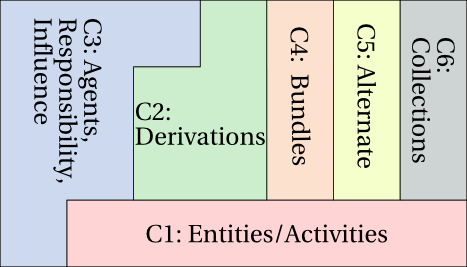 The fourth component is concerned with bundles, a mechanism to support provenance of provenance. A prov:Bundle identifies a set of provenance descriptions, and is an extension of prov:Entity, so allowing provenance of provenance to be expressed by referencing the associated entity. The content of a bundle, i.e. its provenance records, can be represented by the prov:BundleConstructor ComplexType and is denoted with the prov:bundleContent xml-element, its prov:id corresponds to the bundle entity. The prov:BundleConstructor ComplexType is used to define a named set of provenance statements. The Bundle Constructor supports the prov:id xml-attribute. The bundle entity associated with a bundle constructor set must have the same prov:id as the bundle constructor set. The xml-element prov:bundleContent is used to denote a set of nested provenance statements from within a prov:Document. Although prov:bundleContent can only be expressed at the prov:document level, the corresponding bundle entities may be specified from either the prov:document or any prov:bundleContent. The fifth component of PROV-DM is concerned with the relations Specialization and Alternate, relating entities to entities. This section introduces further elements of PROV. The xml-attribute used to identify an instances of a prov-"type" or prov-"relation". A xml-attribute that denotes a reference-by-id to an instance of a prov-"type" or prov-"relation". The PROV-DM defined prov-"attributes" are represented in XML as xml-elements. Relations defined by the PROV-DM to have prov-"type" Value have type xs:anySimpleType in PROV-XML unless otherwise specified. The root xml-element of all PROV-XML documents is prov:document which has xml-type prov:Document. Similar to a prov:BundleConstructor, the prov:Document complexType is used to define a set of provenance statements. does not support the prov:id xml-attribute. The xml-element prov:document may only be used as the root xml-element of a a PROV-XML document. The prov:other xml-element provides a place to include non-PROV xml-elements inside a prov:document or prov:bundleContent. The xml-element prov:other may be used in a prov:document or a prov:bundleContent but may not be used inside a prov-"relation", entity, or activity xml-element. The Internet Media Type / MIME type for PROV-XML is "application/provenance+xml". It is recommended that PROV-XML files have the extension ".provx" (all lowercase) on all platforms. It is recommended that PROV-XML files stored on Macintosh HFS file systems be given a file type of TEXT. The information that follows has been registered with the IANA. Same as charset parameter of application/xml as specified in RFC3023 (Section 3.2). Same as encoding considerations of application/xml as specified in RFC 3023 (Section 3.2). PROV-XML is an XML language for describing the provenance of things; applications may evaluate given data to dereference URIs, invoking the security considerations of the scheme for that URI. Note in particular, the privacy issues in [[RFC3023]] section 10 for HTTP URIs. Data obtained from an inaccurate or malicious data source may lead to inaccurate or misleading conclusions, as well as the dereferencing of unintended URIs. Care must be taken to align the trust in consulted resources with the sensitivity of the intended use of the data. PROV-XML can express data which is presented to the user, for example, by means of label attributes. Application rendering strings retrieved from untrusted PROV-N documents must ensure that malignant strings may not be used to mislead the reader. The security considerations in the media type registration for XML ([[RFC3023]] section 10) provide additional guidance around the expression of arbitrary data and markup. PROV-XML is a language for describing the provenance of things, and therefore a PROV-XML document is metadata for other resources. Untrusted PROV-XML documents may mislead its consumers by indicating that a third-party resource has a reputable lineage, when it has not. Provenance of PROV-XML document should be sought. PROV-XML uses QNames mappable to IRIs as term identifiers. Applications interpreting data expressed in PROV-XML should address the security issues of Internationalized Resource Identifiers (IRIs) [[RFC3987]] Section 8, as well as Uniform Resource Identifier (URI): Generic Syntax [[RFC3986]] Section 7. Multiple IRIs may have the same appearance. Characters in different scripts may look similar (a Cyrillic "о" may appear similar to a Latin "o"). A character followed by combining characters may have the same visual representation as another character (LATIN SMALL LETTER E followed by COMBINING ACUTE ACCENT has the same visual representation as LATIN SMALL LETTER E WITH ACUTE). Any person or application that is writing or interpreting data in PROV-N must take care to use the IRI that matches the intended semantics, and avoid IRIs that make look similar. Further information about matching of similar characters can be found in Unicode Security Considerations [[UNISEC]] and Internationalized Resource Identifiers (IRIs) [[RFC3987]] Section 8. PROV-XML: The PROV XML Schema, Hua, Tilmes, Zednik (eds), Moreau http://www.w3.org/TR/prov-xml/, 2013. It may be used by any application for publishing provenance information. This format is designed to be an XML form of provenance. PROV-XML documents are XML documents and thus may have initial strings similar to any XML document. The PROV-XML specification is the product of the World Wide Web Consortium's Provenance Working Group. The W3C, and the W3C Provenance Working Group, have change control over this specification. The main PROV schema is an aggregation of the PROV core schema and all PROV-defined extension schemas. The PROV core schema defines an XML representation of the PROV data model defined by the PROV-DM. Extensions to PROV, defined in WG Notes, are defined in separate extension schemas. Extension schemas are schemas in the PROV Namespace that define additional PROV elements not from the PROV-DM. Workgroup Notes provide extension schemas to define their Note-introduced PROV elements. Extension schemas must import (using xs:include) the prov-core.xsd schema and make use of a substitution group on the prov:internalElement to add extension defined elements to the list of valid PROV elements in a bundle or document. Updated naming conventions to clarify distinction between PROV elements, attributes, and types and XML elements, attributes, and types. Added links to PROV-DM term/concepts in Table 1. Removed inline schema, added links to published schemas. Updated BundleConstructor and Document sections to reflect changes to schema. Added Other section for prov:other element and type. Updated the Status of this Document section. Added a note about potential OXM issues to Schema Modularization section, referenced FAQ entry on subject. Updated table 1 with XML Schema Referencing Element column. Added Type Conventions and Schema Modularization sections to XML Schema Design section. Updated Bundle section to reflect changes in schema design. Updated inline schema and schema examples to reflect updates to schema design. Updated text that appears before schema snippets and examples in PROV XML Schema subsections. Added extension schema example to appendix. Removed Macintosh HFS file type paragraph from Media Type section. Made all references informative instead of normative since PROV-XML is a note. This document has been produced by the PROV Working Group, and its contents reflect extensive discussion within the Working Group as a whole. The editors extend special thanks to Luc Moreau (University of Southampton), Paul Groth (Vrije Universiteit) and James Cheney (University of Edinburgh) for their thorough reviews. Members of the PROV Working Group at the time of publication of this document were: Ilkay Altintas (Invited expert), Reza B'Far (Oracle Corporation), Khalid Belhajjame (University of Manchester), James Cheney (University of Edinburgh, School of Informatics), Sam Coppens (iMinds - Ghent University), David Corsar (University of Aberdeen, Computing Science), Stephen Cresswell (The National Archives), Tom De Nies (iMinds - Ghent University), Helena Deus (DERI Galway at the National University of Ireland, Galway, Ireland), Simon Dobson (Invited expert), Martin Doerr (Foundation for Research and Technology - Hellas(FORTH)), Kai Eckert (Invited expert), Jean-Pierre EVAIN (European Broadcasting Union, EBU-UER), James Frew (Invited expert), Irini Fundulaki (Foundation for Research and Technology - Hellas(FORTH)), Daniel Garijo (Universidad Politécnica de Madrid), Yolanda Gil (Invited expert), Ryan Golden (Oracle Corporation), Paul Groth (Vrije Universiteit), Olaf Hartig (Invited expert), David Hau (National Cancer Institute, NCI), Sandro Hawke (W3C/MIT), Jörn Hees (German Research Center for Artificial Intelligence (DFKI) Gmbh), Ivan Herman, (W3C/ERCIM), Ralph Hodgson (TopQuadrant), Hook Hua (Invited expert), Trung Dong Huynh (University of Southampton), Graham Klyne (University of Oxford), Michael Lang (Revelytix, Inc.), Timothy Lebo (Rensselaer Polytechnic Institute), James McCusker (Rensselaer Polytechnic Institute), Deborah McGuinness (Rensselaer Polytechnic Institute), Simon Miles (Invited expert), Paolo Missier (School of Computing Science, Newcastle university), Luc Moreau (University of Southampton), James Myers (Rensselaer Polytechnic Institute), Vinh Nguyen (Wright State University), Edoardo Pignotti (University of Aberdeen, Computing Science), Paulo da Silva Pinheiro (Rensselaer Polytechnic Institute), Carl Reed (Open Geospatial Consortium), Adam Retter (Invited Expert), Christine Runnegar (Invited expert), Satya Sahoo (Invited expert), David Schaengold (Revelytix, Inc.), Daniel Schutzer (FSTC, Financial Services Technology Consortium), Yogesh Simmhan (Invited expert), Stian Soiland-Reyes (University of Manchester), Eric Stephan (Pacific Northwest National Laboratory), Linda Stewart (The National Archives), Ed Summers (Library of Congress), Maria Theodoridou (Foundation for Research and Technology - Hellas(FORTH)), Ted Thibodeau (OpenLink Software Inc.), Curt Tilmes (National Aeronautics and Space Administration), Craig Trim (IBM Corporation), Stephan Zednik (Rensselaer Polytechnic Institute), Jun Zhao (University of Oxford), Yuting Zhao (University of Aberdeen, Computing Science).